Still cold, very cold, so after lunch it was off to the warm gym to do a 45 minute run in HR zone 2. Except I carried on and ended up doing an hour because at this stage it cant do any harm & I have a 1/2 marathon next week in aid of Pancreatic Cancer. Nest week is going to be challenging to juggle work, home life & training but tomorrow is a day off, well I say day off, I am up at 0430 for a car to the airport at 5am for a flight to Amsterdam, back again in the evening so I will try & relax & enjoy the day. The new bike was finally ready yesterday so here it is. 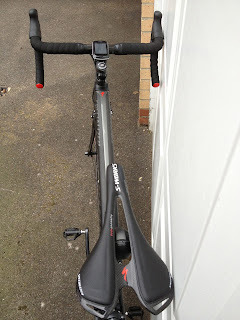 Its a Specialized S-Works Venge with Ultegra Di2 electronic shifting, wheels are Soul CA5.0 carbon clinchers, stem is an S-Works SL 130mm, bars are S-Works carbon. Needs a few finishing touches before it's completely ready, I hope I can do it justice as the test bike was epic and that wasn't an S-Works frame set.